Ash Tyler (played by Shazad Latif) in "Star Trek: Discovery" Episode 9, "Into the Forest I Go." Warning: This recap includes spoilers for Episode 9 of "Star Trek: Discovery," and also includes discussion of sensitive and potentially triggering topics. "Star Trek: Discovery" was an action-packed episode this week for the show's midseason finale, featuring Klingon fighting (both by ship and by hand), and lots of use of the spore drive. The episode also ended up being weirdly timely as the crew discussed a serious issue making the rounds in Hollywood these past few weeks. The crew appears to be in a bad spot as they finish out the first half of Season 1 — more details below. We're anxiously awaiting their return in the new year. "Star Trek: Discovery" returns to CBS All Access in the United States on Sunday (Jan. 7). 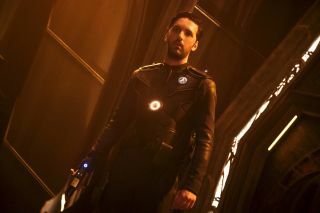 "Discovery" was also renewed for a second season, although a release date has not been disclosed yet. Episode 8 ended with the Klingons and the USS Discovery both about to meet above the planet Pahvo. The residents of that planet brought the two warring parties together to seek peace, but Starfleet isn't having any of that. This week's Episode 9 opens with Capt. Gabriel Lorca (Jason Isaacs) receiving a direct order to retreat and find another way to disable the Klingons' ship-cloaking technology — the aim of his failed mission to Pahvo. We all know Lorca by now, so it's unsurprising that he disobeys this order and plans to fix the problem using that troublesome spore drive that warps Discovery from place to place instantly. The crew beams Michael Burnham (Sonequa Martin-Green) and the USS Discovery security officer Ash Tyler (Shazad Latif) aboard the Klingon ship to place two beacons on board. Meanwhile, Lt. Paul Stamets (Anthony Rapp) uses his special connection with the spore drive to guide 133 small jumps in circles around the Klingon ship. Between the beacons and the jumps, Discovery determines how to detect the Klingon ship's position in space, rendering the cloak useless. The spore drive is already hurting Stamets' brain even before the 133 jumps. It's unclear that he will survive the ordeal, and initially he doesn't want to do it. Lorca then shows Stamets that the spore drive's jumps are mapping out the locations of alternative universes. Stamets, always the explorer, bravely agrees to do the jumps as requested, but as we'll see this probably wasn't the best decision on anyone's part. Stamets says, "I love you," to boyfriend and doctor Hugh Culber (Wilson Cruz) as he goes through jump after jump. Culber, who yells, "I love you, too," back to Stamets, keeps Stamets alive with medication. Eventually the crew successfully carries out their mission, mapping the ship's location and retrieving Burnham and Tyler (plus two more unexpected visitors), which lets them blow up the Klingon ship. Stamets emerges and all appears to be well until he prepares to perform one last jump to get Discovery back to a Starfleet base. Stamets and Culber talk about vacation plans and share a rare on-screen gay kiss (prompting an all-caps "awww" in my notes on this episode). But something goes wrong when Stamets connects himself to the spore drive one last time. (Pro tip: Never talk about vacation or retirement plans after one last mission, because something is bound to go wrong.) He collapses, the jump fails and Discovery is stranded somewhere. The crew can't figure out the ship's location; perhaps it's one of those alternative universes we just heard about? All we know is they are surrounded by Klingon debris. Stamets, meanwhile, is hallucinating and ill, but we don't yet know how bad his condition is. It's worth spending a few minutes on the scene near the episode's end, when Tyler reveals to Burnham that a Klingon abused him. "Star Trek" is a show that historically embraces diversity and discussion of difficult topics. Although no one could have predicted the ongoing firestorm of controversy in Hollywood lately as Episode 9 aired, it's good to see the issue of power and abuse discussed so openly in fiction as well as in real life. It's only by shining a light that we as a society can start to come to solutions. Burnham and Tyler's adventures on the Klingon ship included running into an injured (but very feisty) Adm. Cornwall, played by Jayne Brook — good to know she is alive, after all. They beam her back to safety on Discovery, and L'Rell, who was in the room with them, jumps in to the transporter beam and also transfers to the starship. I expected Lorca to be more surprised when two new crew members showed up unexpectedly, but he quickly praised everyone for finding "an extra prize" and moved on to more pressing matters. This captain impresses me more every episode. Burnham's fight with Kol, complete with the Klingon bat'leth sword, was a fun watch. That said, the end was a little disappointing — of course she got beamed to Discovery as she was losing the fight. Yet it was good to see Burnham snag dog tags of her previous captain, Philippa Georgiou (Michelle Yeoh), from Kol's grasp. Georgiou finally got justice after dying at the hands of the Klingons back in Episode 2. I also loved the use of the universal communicator that translated Burnham's English to Klingon, and Kol's Klingon to English. The taunts about the communicator were awesome. Burnham: "This is an example of human ingenuity." Kol, in response: "All I see is another attempt by humanity to rob us of our identity." Replies Burnham: "It's proof of our desire to communicate." I wasn't all that impressed with the portrayal of the Klingons when it came to figuring out Discovery's ruse. It wasn't until almost the end of the episode when they realized Discovery's spore-drive jumps might have ulterior motives besides taunting them. For professional warriors, they seemed poor strategists. Lorca's inspirational speech to his crew showed how far "Discovery" has come in just half a season. A part of the lovely script-writing: "When I took over command of this ship, you were a crew of polite scientists. Now I look at you — you are fierce warriors, all. No other Federation vessel would have a chance of pulling this off." "Star Trek: Discovery" returns to CBS All Access in the United States on Sunday (Jan. 7). Each episode is available at 8:30 p.m. Eastern time.